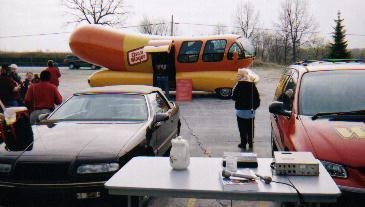 APRIL 2002-AUGUST 2004: WCSR, Hillsdale, Michigan. 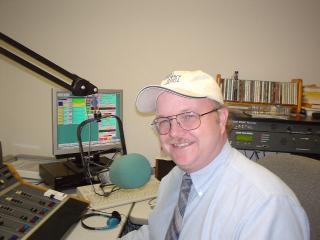 Was morning show host on local Full-Service AM/FM combo. Local talk, music, and information format. Directed installation and integration of new on-air software, and enjoyed the hometown "feel" of this very special radio station, which truly knows the meaning of "localism." APRIL 2001-JANUARY 2004: WEAX Operations Manager, "88-X" owned by Tri-State University in Angola, IN. Brought station back from off-air status. Re-formatted station to "Classic Rock wth New Music Blocks" to gain audience not only on campus, but in the community. I (unofficially)Taught students the techniques of radio production and performance. . I still keep tabs with some of the students I helped train, and value those friendships. JANUARY 1993-MAY 2002: WLKI, Angola, IN. Hosted morning show for 9 years, moved to late afternoon "drive" show as duties at Tri-State University increased. Instituted and chaired WLKI's first 6 county-wide food-drives. Organized Angola's "Tree-for All" with the Parks and Recreation Department to raise money for replacing vandalized trees in Commons Park. Started monthly "Community Cafe" series in cooperation with the Steuben County Community Foundation to publicize the foundation and promote WLKI. I enjoy extensive on-air phones, and community-minded promotions. 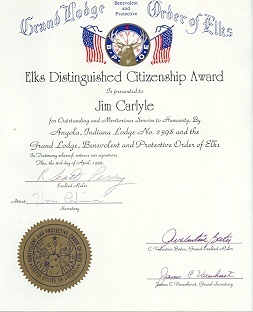 I was very honored in 1999 to be awarded the "Elks Distinguished Citizenship Award" by Angola, Indiana Lodge No. 2398 and the Grand Lodge, Benevolent and Protective Order of Elks. 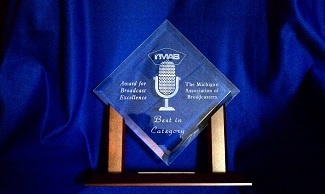 The award was based on my community involvement via the airwaves. It was an even "higher" honor to share that award with my co-host, Brook Steed as the Elks had NEVER given that award to two people at one time in one year. JANUARY 1992-APRIL 1993: WCSR Regular Evening program host in Hillsdale, MI. AUGUST 1991-JANUARY 1992: WYKX, Escanaba, MI. 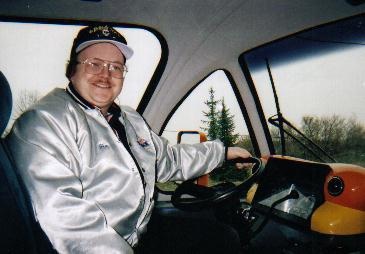 Program Director/Afternoon Drive host of 100kw country station. WITL, Lansing, MI: Regular weekend show 1991, currently on-call fill-in announcer. WKHM, Jackson, MI: Evening show host with open phones on full-service AC formatted station. WBCK, Battle Creek, MI: Weekend shift while in college, hosting Sunday Mornings with live news and mid-day/afternoon fill-in during hosts' vacations. My first "real" radio job, where I begain paying my dues to the industry...and like most things worthwhile, you never STOP paying them. format, music scheduling, or categories. When we talked on the air about things in our community. 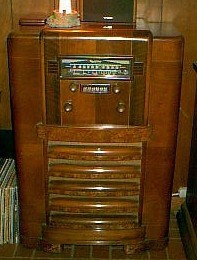 When spontaneous conversation was considered entertainment on the air. When listeners were a PART of what we do, not a "target audience." When good radio was judged by the audience, not by we "radio people"
..and it showed in their positive reaction to our existence in their community. When trivia was fun and a great reason for listeners to participate on the air. When we did SHOWS not SHIFTS. When radio was who we ARE, not what we DO. When worrying about our competition was as simple as doing the best WE can do in our own studios and not watching the station and format across the street or across town. 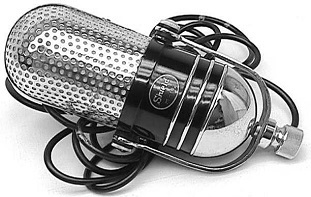 When radio was a career not a job, and offered personal rewards greater than our paychecks. CAN IT STILL BE THIS WAY? YES- But only if WE make the difference. Dont just read this, digest it...and MAKE THAT DIFFERENCE. WE are the teachers of future radio and media people. WE are the people our community turns to for information, a smile, and companionship. Dont let them down. Just some fun pics of radio and non-radio related things for Jim Carlyle. Your average picture collections. Jim doesn't get to "Blog" as much as he'd like...so let him know if you read 'em!